Lovastatin as a member of 3-hydroxy-3-methylglutaryl-coenzyme A (HMG-CoA) reductase inhibitors is used as a lipid-lowering agent. It can also inhibit the formation of hydrogen peroxide and superoxide anion and finally leads to decline in oxidative stress processes. Here, we evaluated whether lovastatin can increase DNA damage resistance of HepG2 cells against genotoxicity of the anticancer drug bleomycin (BLM). HepG2 cells were incubated with different concentrations of lovastatin (0.1, 0.5, 1, 5 µM) before exposure to BLM (0.5 µg/mL for one h). The genotoxic dose of BLM and lovastatin was separately determined and comet assay was used to evaluate the genotoxicity. After trapping cells in agarose coated lames, they were lysed and the electrophoresis was done in alkaline pH, then colored and monitored by florescent microscope. The results of this study indicated that lovastatin in doses lower than 5 µM has genoprotective effect and in doses higher than 50 µM is genotoxic. In conclusion, lovastatin is able to protect genotoxic effects of BLM in HepG2 cells. Further studies are needed to elucidate the mechanism(s) involved in this process. Bleomycin (BLM) is used either in monotherapy or in combination to treat several malignancies including soft tissue carcinomas, epidermoid carcinoma of head and neck, squamous cell carcinoma, lymphangioma, testicular tumors, non-Hodgkin's lymphoma, and Kaposi sarcoma  . In the presence of Fe(II), oxygen and a reducing electron, BLM transforms to its active metabolite leading to production of hydrogen peroxide and some free radicals such as superoxide and hydroxyl. In this way, it causes damage to DNA leading to cell cycle arrest, apoptosis and cell death  . Bleomycin-hydrolase is the enzyme responsible for inactivation of BLM in both normal and cancerous cells  . The susceptibility of both normal and tumor tissue to BLM-induced toxicity is dependent on the level of BLM-hydrolase which hydrolyzes the amide bond in the p-aminoalanine moiety of BLM. Normal tissues with low levels of BLM-hydrolase, such as lung and skin tissue, are sensitive to injury by BLM toxicity. Tumor cells that acquire resistance to this compound often have high levels of BLM-hydrolase activity  . The pulmonary toxicity, dermal toxicity and genetic toxicity are the most important side effects of BLM. Inflammation of lung tissue is the first sign of pulmonary toxicity leads to pulmonary fibrosis  . Skin toxicity appears to be erythema and hyper pigmentation  . Developing secondary cancers occur due to DNA damage effect of BLM in normal tissues , . Statins used clinically as lipid-lowering drugs have numerous additional biological effects  . Lovastatin enhances the activity of glutathione peroxidase and reduces the amount of hydrogen peroxide  . Lovastatin reduces the oxidation of LDL by increasing the activity of enzymes such as paraoxonase, arylesterase and catalase and inhibits the formation of hydrogen peroxide and superoxide anion and finally leads to decline in oxidative stress processes. Lovastatin has shown protective effects against hepatic and cardiac toxicity of doxorubicin and prevent DNA damage in normal cells following administration of cisplatin as an anticancer drug and in contemporary use with doxorubicin increases the therapeutic effects ,,, . The comet assay or single cell gel electrophoresis is the most well-known method for evaluation of DNA damage  . This method can sensitively detect the DNA damage based on micro electrophoresis  . In this research, we used HepG2 cells (hepatoma cells) for specialized liver function and comparable activities with human hepatocytes. The cells trapped in the agarose gel and lysed under the alkaline pH in order to find the possibility of presenting a little opening in the DNA. In electrophoresis, the DNA molecules move toward anode due to the effect of the electrical flow and form the comets. The size of the DNA fragments and the number of broken ends determine the pattern of comet formation  . In the present study using an in vitro model, we investigated the effect of lovastatin on genetic injury induced by BLM. 02-Amino-2-(hydroxymethyl)-1,3-propanediol (Tris), Triton X-100, H 2 O 2 , NaCl, EDTA and NaOH were purchased from Merck Co. (Germany). Low melting point agarose (LMA), Na 2 HPO 4 , KCl and ethidium bromide were supplied by Sigma Co. (USA). Normal melting point agarose (NMA) was obtained from Cinnagen Co. (Iran). Roswell Park Memorial Institute (RPMI-1640), fetal bovine serum (FBS) and antibiotics were purchased from PAA Co. (Australia). Lovastatin was a gift from Amin Pharmaceutical Company (Iran). BLM was procured from Cell Pharm Co. (Germany). A solution of 5 mM lovastatin in ethanol was prepared. NaOH (1.5 mL, 0.1 M) was added and heated at 50 °C for 2 h, neutralized with HCl and distillated to the volume of 20 mL. This stock solution was stored frozen in aliquots. The human hepatoma (HepG2) cell line was obtained from Pasteur institute of Iran (Iran, Tehran) and cultured in RPMI medium containing 10% fetal bovine serum and 250 μL of penicillin/streptomycin to avoid the growth of undesirable and pathogenic bacterial microorganisms and incubated under 5% CO 2 at 37 °C in micro filter plates. In order to determine adequacy of genotoxic concentration of BLM, cells were incubated with different concentrations of BLM (0.1, 0.5, 1, 5, 10 µg/mL) for one h period and then comet assay was performed. To determine the genoprotective concentration of lovastatin against DNA damage of BLM, cells were incubated with different concentrations of lovastatin (0.1, 0.5, 1, 5 µM) for 1 h prior to incubation with BLM (0.5 µg/mL for 1 h) and finally the comet assay was performed. In order to confirm the safety of lovastatin, cells were incubated with different concentrations of lovastatin (1, 5, 10, 50, 100 µM) for 1 h followed by comet assay. The comet assay procedure has been described in our previous studies (17,18). Briefly, incubated cell suspensions (1×10  cells/mL) were mixed with 1% LMP agarose (37 °C) and were placed on the precoated slides (1% NMP agarose). The slides were respectively incubated with lysis solution (pH, 10) and electrophoresis buffer (pH > 13) for 40 min. Electrophoresis was carried out for 40 min (25 V, 300 mA). After this stage, the slides were rinsed with distilled water and were placed in neutralization solution (pH, 7.5) for 10 min. Slides were covered by sufficient dye solution (20 μg/mL ethidium bromide) for 5 min and washed with distillated water. Finally comets were visualized under ×400 magnification using fluorescence microscopy with an excitation filter of 510‐560 nm and barrier filter of 590 nm. All stages of comet assay were performed at room temperature and in dark conditions and all solutions were prepared freshly and used coolly. One-way analysis of variance (ANOVA) followed by Tukey's multiple comparison post hoc test was used to compare the results of comet assay. The P-values of 0.05 and less were considered as statistically significant. Based on previous researches, the genotoxic concentration of BLM was tested in order to determine the sufficient genotoxic concentration on HepG2 cells. Cells were incubated with different concentrations of BLM (0.1, 0.5, 1, 5, 10 µg/mL) for 1 h fallowed by the comet assay. The result of the ANOVA indicated that the tail length, % DNA in the tail and tail moment at all concentrations of BLM were significantly (P < 0.001) [Table 1] greater than those of control group. According to these results, 0.5 µg/mL of BLM adopted as suitable genotoxic concentration for further experiments. In order to investigate probable genoprotective effects of lovastatin on DNA damage induced by BLM, HepG2 cells were incubated with different concentrations of lovastatin (0.1, 0.5, 1, 5 µM) for 1 h followed by 1 h incubating period for 0.5 µg/mL concentration of BLM [Figure 1]. All three studied parameters including tail length, % DNA in tail, and tail moment were significantly reduced the induced genotoxicity by BLM. Genoprotective effects was inversely dependent on the lovastatin concentrations. The highest concentration of lovastatin (5 µM) had no genoprotective effect on BLM-induced toxicity. 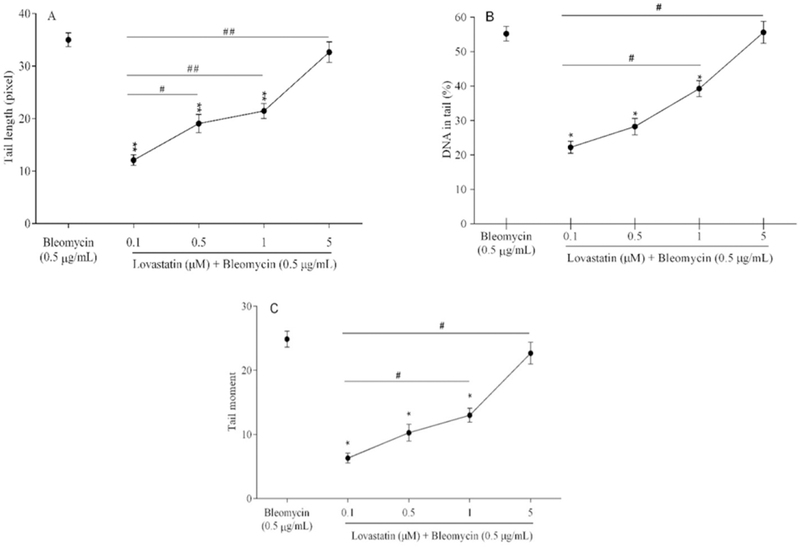 Pretreatment of HepG2 cells with different concentrations of lovastatin indicated that lovastatin at concentrations 0.1, 0.5 and 1 µM inhibited the genotoxic effects of BLM when compared with the BLM-treated group (0.5 µg/mL) [Figure 1]. 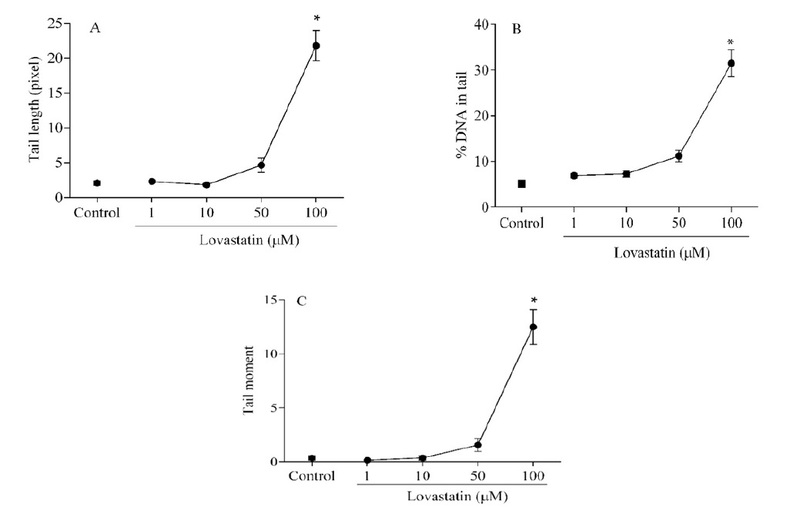 Safety of lovastatin at protective concentrations was assessed by incubating HepG2 cells for 1 h at different concentrations of lovastatin (1, 10, 50 and 100 µM). Statistical comparison with the control group represented the safety of lovastatin up to the concentration of 50 µM [Figure 2]. Bleomycin, known as an effective antitumor agent, is clinically used in chemotherapy in variety of tumor types. The cytotoxicity of the drug is due to the formation of a complex of BLM, ferrous iron and molecular oxygen which results in the release of oxygen radicals at the site of intercalation with DNA that is in direct association with the genetic lesions  . The activated form of BLM is able to create single- and double-stranded DNA breaks by removing 4′ -hydrogen from C4 of the deoxyribose moiety of a pyrimidine 3′ to a guanine  . Generation of reactive oxygen species, such as superoxide, hydrogen peroxide, and hydroxyl radical by BLM causes DNA strand breaks  . BLM seems to undergo an average of at least three and possibly up to 10 oxidation-reduction cycles in the presence of DNA before inactivation  . Some researchers indicated that if BLM can react with DNA more than once, perhaps BLM is not chemically changed after its interaction with DNA. Researchers found that most of BLM-induced DNA breakage is repaired within 5 min, whereas the rejoining of DNA nicks continues for 1 h or more at a slower rate than in the first phase. There also seems to be a clear genetic basis for the differences in repair capacity  . The result of a study demonstrated the BLM-mediated generation of reactive oxygen species (ROS) to be modified by vitamin C and ß-carotene and their interaction with endogenous antioxidant enzymes . It has been suggested by a number of investigators that, lovastatin has induced an increase in the incidence of spontaneous hepatocellular and pulmonary tumors; this is most likely representative of the phenomenon of tumor promotion at the high doses used  . Rho GTPases, as a member of Rho family, control a wide range of cellular functions including gene expression, cell adhesion, motility and apoptosis  . They require C-terminal prenylation for correct intracellular localization and function  . Statins, such as lovastatin are HMG-CoA-reductase inhibitors widely used for lipid-lowering reason, cause a depletion of the cellular pool of isoprene precursor molecules. They impact C-terminal prenylation of Rho GTPases, thus in turn leading to a down-modulation of Rho-regulated signal mechanisms  . High doses of statins, including lovastatin, is reported to promote the killing effects of tumor-therapeutic drugs and radiation on tumor cells by impairing G1-S transition and triggering apoptosis  . Low dose of lovastatin was found to protect primary human umbilical vein endothelial cells (HUVEC) from cell death induced by the anticancer drug doxorubicin and radiation  . Statins impact the C-terminal prenylation of regulatory proteins, including small GTPases of the Ras and Rho family. Therefore, Ras/Rho GTPases are physiologically relevant targets of statins  . Various statins have been reported to be proapoptotic on tumor cells and to potentiate the cell killing efficiency of anticancer therapeutics, including antineoplastic drugs and radiation  . These anticancer effects of statins require high concentrations (i.e. >10 µM) and, lower doses of lovastatin (i.e. <10 µM) protect primary human endothelial cells from cell killing by the anticancer drug doxorubicin  . In line with these researches, our study represents the genoprotective effect of lovastatin in doses lower than 5 µM and genotoxic effect in doses more than 50 µM. The doses between 5 to 50 µM are not protective against genotoxic effect of BLM while are safe for DNA in single use. Based on our data we suggest that lovastatin is clinically useful to alleviate side effects of chemotherapy with BLM thus improving the overall therapeutic efficiency and tolerance of tumor therapy. In conclusion, a low dose of lovastatin reduces the genotoxic effects of BLM as an anticancer drug. This occurs via inhibition of hydrogen peroxide and superoxide anion formation and finally leads to decline in oxidative stress processes . This protective effect is dose dependent. Taketa C, Shimosato Y, Nagano A, Washizu K, Matsuura S, Ono I, et al. Effects of bleomycin for epidermoid carcinoma of head and neck. Jpn J Clin Oncol. 2010;40(9):e41-53. Nuver J, De Haas EC, Van Zweeden M, Gietema JA, Meijer C. Vascular damage in testicular cancer patients: a study on endothelial activation by bleomycin and cisplatin in vitro. Oncol Rep. 2010;23(1):247-253. Sikic BI, Clinical pharmacology of bleomycin. In: Sikic BI, Rozencweig M, Carter SK, editor. Bleomycin chemotherapy. 1 st ed. Academic Press; 1985. pp. 37-43. Chen J, Ghorai MK, Kenney G, Stubbe J. Mechanistic studies on bleomycin-mediated DNA damage: multiple binding modes can result in double-stranded DNA cleavage. Nucleic Acids Res. 2008;36(11):3781-3790. Galm U, Hager MH, Van Lanen SG, Ju J, Thorson JS, Shen B. Antitumor antibiotics: bleomycin, enediynes, and mitomycin. Chem Rev. 2005;105(2):739-758. Kamata Y, Taniguchi A, Yamamoto M, Nomura J, Ishihara K, Takahara H, et al. Neutral cysteine protease bleomycin hydrolase is essential for the breakdown of deiminated filaggrin into amino acids. J Biol Chem. 2009;284(19):12829-12836. 7. Chitra P, Saiprasad G, Manikandan R, Sudhandiran G. Berberine attenuates bleomycin induced pulmonary toxicity and fibrosis via suppressing NF-êB dependant TGF-â activation: A biphasic experimental study. Toxicol Lett. 2013;219(2): 178-193. Fyfe A, McKay P. Toxicities associated with bleomycin. J R Coll Physicians Edinb. 2010;40(3):213-215. Danesi CC, Dihl RR, Bellagamba BC, de Andrade HHR, Cunha KS, Guimarães NN, et al. Genotoxicity testing of combined treatment with cisplatin, bleomycin, and 5-fluorouracil in somatic cells of Drosophila melanogaster. Mutat Res Genet Toxicol Environ Mutagen. 2012;747(2):228-233. Fritz G. HMG-CoA reductase inhibitors (statins) as anticancer drugs (review). Int J Oncol. 2005;27:1401-1409. Nezami N, Ghorbanihaghjo A, Argani H, Safa J, Rashtchizadeh N, Vatankhah AM, et al. Lovastatin enhances paraoxonase enzyme activity and quells low-density lipoprotein susceptibility to oxidation in type 2 diabetic nephropathy. Clin Biochem. 2011;44(2):165-170. Chen L, Haught WH, Yang B, Saldeen TG, Parathasarathy S, Mehta JL. Preservation of endogenous antioxidant activity and inhibition of lipid peroxidation as common mechanisms of antiatherosclerotic effects of vitamin e, lovastatin and amlodipine. J Am Coll Cardiol. 1997;30(2): 569-575. Huelsenbeck J, Henninger C, Schad A, Lackner K, Kaina B, Fritz G. Inhibition of Rac1 signaling by lovastatin protects against anthracycline-induced cardiac toxicity. Cell Death Dis. 2011;2(8):e190. doi: 10.1038/cddis.2011.65. Shi Y, Felley-Bosco E, Marti TM, Stahel RA. Differential effects of lovastatin on cisplatin responses in normal human mesothelial cells versus cancer cells: implication for therapy. PLoS ONE. 2012;7(9): e45354. doi: 10.1371/journal.pone. cancer cells: implication for therapy. PLoS ONE. 2012;7(9): e45354. doi: 10.1371/journal.pone. 0045354. Mozaffarieh M, Schoetzau A, Sauter M, Grieshaber M, Orgül S, Golubnitschaja O, et al. Comet assay analysis of single-stranded DNA breaks in circulating leukocytes of glaucoma patients. Mol Vis. 2008;14:1584-1588. Sardas S. Genotoxicity tests and their use in occupational toxicology as biomarkers. Indoor Built Environ. 2005;14(6):521-525. Tice R, Agurell E, Anderson D, Burlinson B, Hartmann A, Kobayashi H, et al. Single cell gel/comet assay: guidelines for in vitro and in vivo genetic toxicology testing. Environ Mol Mutagen. 2000;35(3):206-221. Liu LV, Bell CB, Wong SD, Wilson SA, Kwak Y, Chow MS, et al. Definition of the intermediates and mechanism of the anticancer drug bleomycin using nuclear resonance vibrational spectroscopy and related methods. Proc Natl Acad Sci. 2010;107(52):22419-22424. Lazo JS. Bleomycin. Canc Chemother Biol Response Modif. 1999;18:39-45. Sugiura Y, Kikuchi T. Formation of superoxide and hydroxy radicals in iron (II)-bleomycin-oxygen system: electron spin resonance detection by spin trapping. J Antibiot. 1978;31(12):1310-1312. Burger RM, Peisach J, Horwitz SB. Mechanism of bleomycin action: in vitro studies. Life Sci. 1981;28(7):715-227. López-Larraza D, De Luca JC, Bianchi NO. The kinetics of DNA damage by bleomycin in mammalian cells. Mutat Res. 1990;232(1):57-61. Desai VG, Lyn‐Cook LE, Aidoo A, Casciano DA, Feuers RJ. Modulation of antioxidant enzymes in bleomycin‐treated rats by vitamin c and â‐carotene. Nutr Cancer. 1997;29(2):127-132. Alberts AW. Discovery, biochemistry and biology of lovastatin. Am J Cardiol. 1988;62(15):J10-J5. Fritz G, Kaina B. Rho GTPases: promising cellular targets for novel anticancer drugs. Curr Cancer Drug Targets. 2006;6(1):1-14. Adamson P, Marshall CJ, Hall A, Tilbrook P. Post-translational modifications of p21rho proteins. J Biol Chem. 1992;267(28):20033-20038. Fritz G, Brachetti C, Kaina B. Lovastatin causes sensitization of HeLa cells to ionizing radiation‐induced apoptosis by the abrogation of G2 blockage. Int J Radiat Biol. 2003;79(8):601-610. Nübel T, Damrot J, Roos WP, Kaina B, Fritz G. Lovastatin protects human endothelial cells from killing by ionizing radiation without impairing induction and repair of DNA double-strand breaks. Clin Cancer Res. 2006;12(3):933-939. Damrot J, Nübel T, Epe B, Roos W, Kaina B, Fritz G. Lovastatin protects human endothelial cells from the genotoxic and cytotoxic effects of the anticancer drugs doxorubicin and etoposide. Br J Pharmacol. 2006;149(8):988-997.